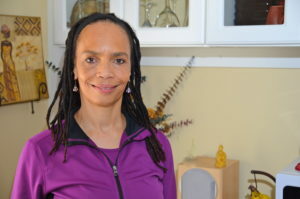 A graduate of Cornell University, Charlene holds a Master’s of Science Degree in Herbal Medicine from Maryland University of Integrative Health and is a Licensed Dietitian. Charlene is also a certified yoga therapist through the International Association of Yoga Therapists and has over 500 hours of yoga teacher training. Charlene’s journey began in her 20s around the time she completed her undergraduate work at Cornell University. Having landed a “dream” job, working for corporate America on Park Avenue in New York City, Charlene found life away from the beautiful gorges of Ithaca quite stressful. Her mother suggested she take a yoga class. One year later, Charlene decided to get out of a city that has buildings so high they hide the sky, and relocated to Seattle, Washington. Life in Seattle brought many changes, including the birth of two sons. Charlene had the great fortune of giving birth at home with a Naturopathic doctor and midwife who began to teach her how to care for her budding little family using plants and nutrition. As Charlene began to learn things, she began to share her new knowledge and experience with friends and family. The more she shared, the bigger her role became in the community and so the more knowledge she strived to gain. After years of her experiential knowledge growth, Charlene decided it was time to study some traditional healing practices more formally. Charlene knew intuitively that plants and good nutrition supported optimal health, yet wanted to learn the science behind it. For her, understanding the sciences provides great clues to understanding the nuances of nature. What better way to get to know herself better than to study the nature of human life? Charlene also believed that this would provide her with the compassion to work with clients who are struggling with their own understanding about health and wellness. Currently, Charlene facilitates wellness lecture and workshops and conducts private sessions with groups and individual clients. Charlene also teaches a variety of yoga classes around the metropolitan DC area. Sign up for our mailing list to hear about new classes and tools from the UH team.